LINKÖPING, Sweden, July 19, 2018 — Twenty-five researchers from seven research institutes in Europe, the U.S., and China have collaborated to draw up rules for designing high-efficiency organic solar cells. The design rules, which challenge some previously held ideas, have been published in Nature Materials. 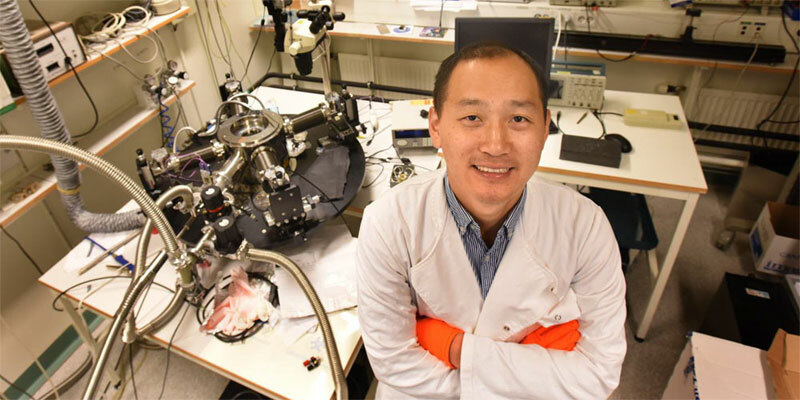 Feng Gao, associate professor at Linköping University, Sweden, is leading the research into how to build more efficient organic solar cells. Courtesy of Göran Billeson. A key challenge facing the development of organic solar cells is how to mitigate the large energy losses that are typical of these cells. The article in Nature Materials presents two fundamental rules to minimize energy losses in organic solar cells: (1) Minimize the energy offset between donor and acceptor components, and (2) make sure that the low-gap component in the blend has a high photoluminescence yield. The team combined spectroscopic and quantum-chemistry approaches to identify the key rules for minimizing voltage losses. The article includes examples of existing and new donor-acceptor systems that combine efficient photocurrent generation with electroluminescence yield up to 0.03 percent, leading to nonradiative voltage losses as small as 0.21 V.
The team says that theoretically, the limit for the fraction of the sun’s energy that can be obtained in solar cells is around 33 percent, but laboratory experiments with silicon-based solar cells have achieved 25 percent at best. “But we now know that there is no difference — the theoretical limit is the same for solar cells manufactured from silicon, perovskites, or polymers,” said professor Olle Inganas. When photons from the sun are absorbed by the semiconducting polymer in a solar cell, electrons in the donor material are raised to an excited state, and holes are formed in the ground state to which the electrons remain attracted. In order to separate these bound electrons and holes, an acceptor material is added. However, this acceptor material usually results in extra energy losses, an issue that has challenged the organic solar cell community for over two decades. The study helps to explain and further improve the performance of recently demonstrated high-open-circuit-voltage organic solar cells. Guided by the design rules, organic solar cells could catch up with their competitors with respect to power-conversion efficiency. The research was published in Nature Materials (doi:10.1038/s41563-018-0128-z).